Barbara Benson lives in Hawaii and has several Afghans. 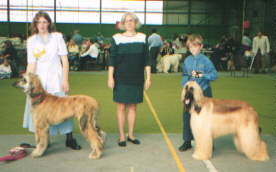 Barbara visited the UK in September and October 1996 and attended (amongst others) the Midland Afghan Hound Club Open Show and judged the Junior handling. On behalf of the Hawaiin Afghan Hound Club, Barbara donated some beautiful medallions , each of which depicted one of the Hawaiin islands and these medallions were awarded as specials to the major winners on the day. Barbara also provided two enormous rosettes for the Junior Handling classes which she judged. Since returning home to Hawaii, Barbara has kindly provided some notes on her visit. My trip to England and Scotland was incredible. That I got to experience judging at your show in September was absolutely thrilling. Before I left the US, I received all sorts of 'advice' on proper procedures in the UK. And even though this was not a championship show, I was a bit nervous about what was expected of me. To my delight, the assignment was made stess free and thoroughly enjoyable by your club members help, warmth, and friendship. My impression of your event was nothing less than FUN! I found that while you all take your dogs very seriously, you tend to keep the handling of them more relaxed, less formal and strict than we Americans. I think that is very positive. I dont't know for sure, but my impression was that there are many more owner-handlers, and much less professional handling than in the US. With Afghans especially, in my mind, that's the way it should be. Regarding the dogs, I am especially biased because of my own which go back to Hazel Arris' Sharazah Night Gambler, who's son Australian Ch Calahorra Pound Sterling came to me in here in Hawaii. While I observed both the heavier boned English Afghans and the lighter boned dogs with American influence, I realized that in many cases, a lot of thought has gone into the combining of the different lines. With obvious excellent results. One or two puppies nearly made it into my backpack for the trip home. Another thing I noticed was the lack of saddles on some of the more mature dogs. While I personally like my dogs 'fuzzed up', I wondered about the full coated dogs, complete with part down the middle, for even a non-championship show. The only thing I found any fault whatsoever with was the compulsive brushing in the ring. From old hands down to juniors, every one was doing so much brushing that they often failed to anticipate or hear the judges. Most judges, and especially those in the breed, are aware of the coat, but are more interested in what is under the mass of hair. Coat will not hide anything to a reputable judge, so why try? Leave the brush ringside, or at least in your belt or pocket for emergencies (?) only. I thank you for allowing me to meet your juniors; I'm only sorry there weren't more. I think that is partly because of the size of the breed, as one young handler could not control the dog. But I surely hope that you in the breed will find and groom young people to enjoy and exhibit our wonderful breed. I hope, too, to revisit your club in the future and meet with you again. Mahalo and Aloha! (With thanks to John Bloor, Magazine Editor, Midland Afghan Hound Club, for permission to publish the above photograph of Barbara with her Junior Handler winners).